Who doesn't love pumpkin pie? 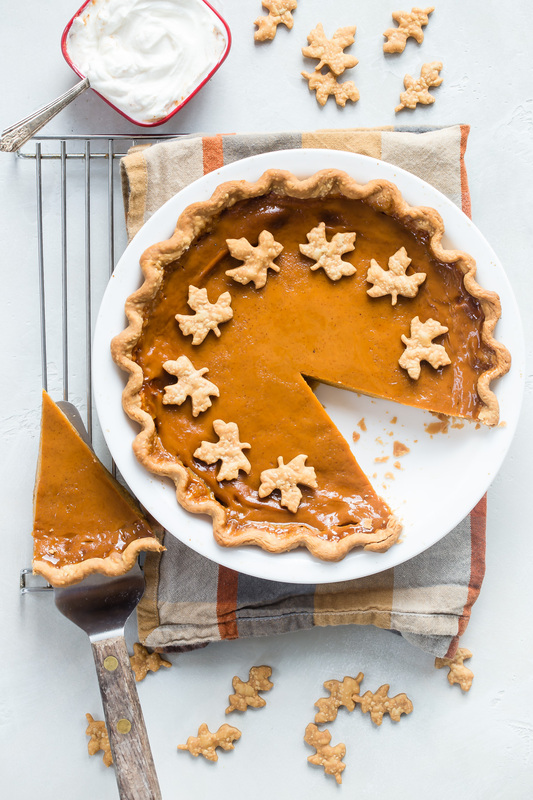 It's a shame that Thanksgiving is the one time of year that it gets any loving, because pumpkin pie is about as perfect as pie gets and is definitely one dessert that the kids and adults I know love equally. I tested this recipe repeatedly over the course of a few days, trying each time to make the filling a bit lighter and less sugary than many of the other pumpkin pie recipes I've baked in the past. Finally, I got it just right. The last pie I made was airy and creamy and had a rich maple flavor that reminded me of all things fall. Just because Thanksgiving only happens once a year doesn't mean you can't keep the great taste of the holiday going the other 364 days of the year. You can make this sweet treat all year long. Now that’s something to be thankful for! 2. Place all of the ingredients in a bowl and whisk to thoroughly combine. 3. Place the pie crust dough (recipe below) between two pieces of parchment paper and roll out to a 1/4 inch thickness. The diameter should be 2 inches wider than your pie dish. 4. Place the dough into a deep dish pie pan (dish) and mold into the shape of the dish (I like to fold the outer crust under itself to make a lip and then take a fork, gently pressing down around the pie crust, to make a pattern around the outer edge of the crust). 5. Take the tines of a fork and poke a few holes in the bottom of the pie crust several times, making sure not to go all the way through (this will keep bubbles from forming in the pie crust when you bake it). 6. Place a piece of parchment paper on top of the pie crust and fill it with dried beans or pie weights (you can reuse the dried beans afterwards). 7. Bake the dough for 15 minutes, remove the parchment paper and beans or weights. 8. Pour the pumpkin filling mixture into the par-baked deep dish pie crust. 9. Bake for 1 hour and 15 minutes or until the center of the pie is set. 10. Cool and refrigerate until cold. 1. Place the first 3 ingredients in a food processor and pulse. 2. Add cold butter and using on/off turns, process until coarse meals forms. 3. Add the water 1 tbsp at a time and process until moist clumps form, adding more water 1 tsp at a time if mixture is dry. 4. Form dough into a disk, wrap in parchment paper or plastic wrap and refrigerate 1 hour or until cold. I have a family member with a dairy allergy. Can I use this recipe and substitute with coconut milk? I think the coconut milk would be delicious and should work! I'm wondering if you did try the coconut milk and how it turned out. We don't have any dairy issues, but it sounds so delicious that I want to make it that way! Melissa, That's what I'm planning to do, also. My mom cannot have dairy, so I'm going to try and substitue coconut milk. I'm hoping it turns out just as good. 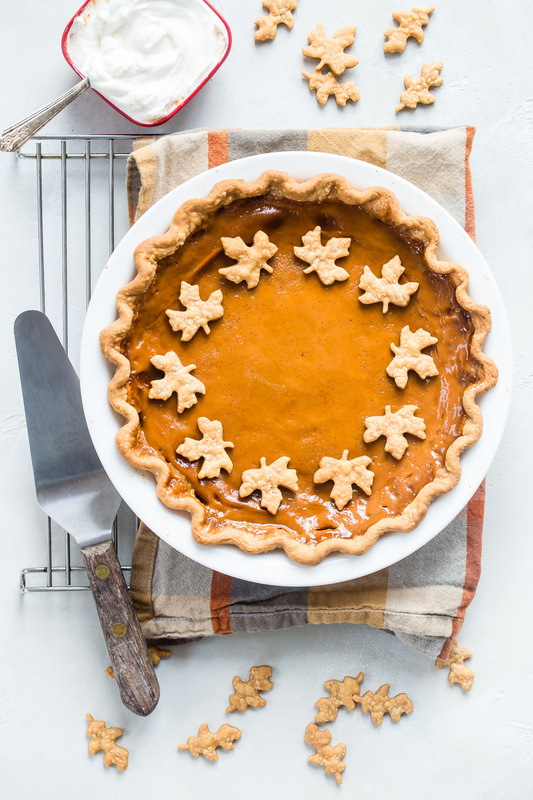 Adding maple syrup to a pumpkin pie is a great idea to give it that extra zing! This pie will be the perfect addition to my dessert spread that already includes White Chocolate Cherry Shortbread! Thanks! Do you think I could sub brown rice syrup for the maple syrup? Or would that change the taste too much? I would just do honey or agave instead. Brown rice syrup is more think and it may change the flavor a bit. I'm so glad to see a pumkin recipe with a reasonable amount of sweetener. I've been making ours the same way for the past few years and I think it actually tastes better than the high suger versions. This looks incredible!!!! Can't wait to try it!!!! why do you use Evaporated Milk instead of the normal one? I too wonder why most pumpkin pie recipes call for evaporated or condensed milk. I always use soy milk or rice milk when baking as everything I use has to be non-dairy. My pumpkin pies always turn out great, so I think regular milk would work fine too. I can't wait to try this recipe! Catherine, you will never remember me, but I was a stylist assistant who worked on a lot of Talbot's jobs back in 2002-03. I couldn't believe it when I saw your smiling face via my goop newsletter! You were always so sweet to me (which doesn't always happen to assistants!) and I remember that time in my life so fondly! It makes me smile to see you with your adorable children! Cheers! I LOVE this recipe. Even my husband who does not usually like pumpkin pie likes this one. I have made 3 in less then 24hrs! The first was a test run and turned out fantastic. The other 2 are going to be pies on Thanksgiving! Thank you for this recipe. I think I am going to be making this one every year! If I can't be bothered making the pastry can I use shortcrust pre-made from the supermarket? Happy Thanksgiving and thanks for this wonderful recipe! I was wondering if there is healthier (less butter) recipe for the pie crust. my daughter as an egg allergy, do you have any suggestions for the egg substitution in this recipe? I FINALLY got DS to try this pie. He loved it!!!! Thanks again!!! Catherine I just wanted to say that this is such a tasty pie! But even better, I like how it uses a whole can of things! other recipes leave me with half a container of pumpkin or milk, or whatever and I am like, \"now what am I supposed to do with this? !\" I know I could try and find another recipe to reuse the left overs but too often it just winds up going to waste. Which is the best canned pumpkin? So tasty! My son can't have dairy or egg so I subbed 4 tablespoons cornstarch for the egg and used 1 cup almond milk rather than 12 oz evaporated milk. It was a little bit runny at first, but after a night in the fridge it thickened up nicely. I'm making it again right now with less maple syrup to see if that helps the consistency. Thanks for the great recipe! I live in France where maple syrup or pumpkin pie are considered exotic. I've baked this pie four times now and it has been a great hit everytime! The recipe is perfect. The fourth time, I used sweetened condensed milk and simply did not add any sugar and I will do the same next time. I also make the puree myself evertime, (I've have tried butternut and it works well). I keep recommending weelicious to my friends: I'm not a great cook but your recipes are always a success. Would it work to omit the pie crust and make this like your pumpkin cheese cake recipe where I would bake this maple pumpkin filling recipe in ramekins and add crushed graham crackers/gingersnap cookies on top? Yes, I think that would work! You might need to bake it longer since it'll probably be deeper in the ramekins! Use the mix to make pumpkin French toast! Thank you for a wonderful recipe! I have never been a fan of pumpkin pie. But my son asked for some. When I said I have never made one, he immediately suggested: why don't you get a recipe from weelicious :)? So I did and all of us really enjoyed this! I also had more filling than fit in my pan and just baked it on its own in a small glass bowl. Next time I will skip the pie and just make that! You could mix soy or rice powder with equal part boiling water to get a similar consistency to evaporated milk. You can also boil down soy or almond milk to get the same effect. Hope this helps! I made this pumpkin pie for Thanksgiving this year, and it's the ONLY pumpkin pie my 2 year old daughter would eat. Thanks so much for sharing! I made this a year ago and I could have sworn that you didnt use brown sugar in it? Did you change the recipe? Is this freezable? And if so, should I just freeze it after it's baked completely? How long can it last in the freezer? Thanks. I noticed that this pie crust recipe does not call for vegetable shortening like in your video. Which would be better to follow to make the maple pumpkin pie? n Thanks. I want to make this pie for Thanksgiving, but don't understand what <br> Greek yogurt means in the ingredient list means. Can someone clarify for me. Thanks! !